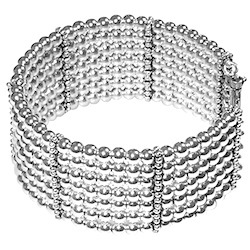 A bracelet made with loose sterling silver beads arranged in seven strands, carried by Turkish foxtail silver chains, preserving shape by means of vertical sterling silver spacers. 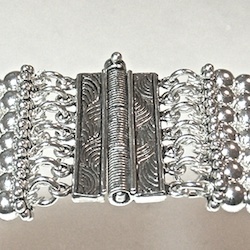 This is not a beadwork bracelet, it does not expose a woven grid between beads as in the beadwork. A hinged clasp with a moving lock pin provides secure and firm closure. Total number of beads: 294. Extremely well polished and shiny, it will make you noticed everywhere everytime. See the alternate length option with price difference below (20 cm / 343 beads).